A highly decorative pair of French early 20thc mahogany & gilt metal armchairs of very good condition. 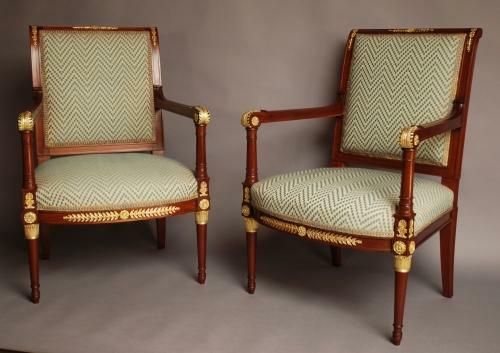 The mahogany frames are upholstered in a blue and beige chevron fabric, the upholstery being in good condition. The gilt metal mounts are of exceptional quality and are of floral & foliage designs. These chairs are of stable construction and can go straight into a home.